Central bank events aren’t the only top-tier catalysts you need to watch out for this busy week since we’ve also got a bunch of jobs reports on the docket. And here are 3 of the most important ones. A jobs report gives forex traders (and policy makers) a snapshot on how the labor market of a particular economy is doing. And gauging the overall health of the labor market is important because a healthy labor market usually means stronger levels of consumer spending. And consumer spending, in turn, is often the backbone of most economies, as well as one of the major drivers of inflation. And it just so happens that we’ve got three of ’em lined up this week. Up first, we’ve got New Zealand’s jobs report coming up later today at 9:45 pm GMT. New Zealand releases its jobs data on a quarterly basis, so it tends to have some heft to it. And last time around, net employment in New Zealand increased by 2.4% during the Q2 period, which is significantly better than the expected 0.6% increase. In addition, the reading for Q1 was upgraded from 1.2% to 1.4%. The bigger-than-expected increase in employment was enough to cause the jobless rate to tick lower from 5.2% to 5.1%, beating expectations that it would tick higher to 5.3%. For the upcoming Q3 jobs report, employment in New Zealand is expected to increase by 0.6%, which is obviously slower than the previous quarter’s 2.4% increase. The expected weaker increase is probably one of the main reasons why the jobless rate is expected to hold steady at 5.1%. Well, we did get an upside surprise alright, since net employment surged by 67.2K, soundly beating the expected 7.5K increase. As a result, forex traders bought up the Loonie across the board. However, forex traders later dumped the Loonie when oil began to retreat. The fact that the jobs report failed to attract additional buyers was rather puzzling, since the jobs report was actually pretty solid overall. Heck, the jobless rate even managed to hold steady at 7.0%, despite the climb in the participation rate from 65.5% to 65.7%, which implies that the Canadian economy was able to handle the influx of working-age Canadians who were enticed to join or rejoin the labor force. Anyhow, for Canada’s October jobs report, many economists forecast that Canada will shed 10.0K jobs, which is a real downer after the previous month’s large increase. The consensus is that this would not be enough to budge the jobless rate from 7.0%, though. 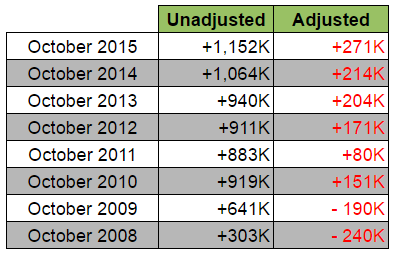 Looking at historical trends, the effects of seasonal adjustments on net employment change don’t seem to be uniform. Economists also seem to have streaks when it comes to forecasting. And in the past few years, economists have been underestimating their forecasts, which is why the actual reading has been coming in better-than-expected. It remains to be seen if we’ll get another upside surprise, though. Finally, we’ve got the U.S. October NFP report, which is the big daddy of ’em all. And if y’all can still recall my Forex Preview for the previous NFP report, I concluded back then that “The leading labor indicators seem to lean more towards a possible downside surprise” for non-farm employment. I also pointed out that historical trends favor a downside surprise. And we sure got a downside surprise alright, since non-farm employment only increased by 156K, missing expectations for a 170K increase. Quite naturally, disappointed forex traders decided to dump the Greenback. However, the actual reading is still above the 100K floor, which is the number of new jobs per month that’s needed to keep up with working-age population growth that’s often cited by Fed Officials, including Fed Head Yellen herself. As such, there was only limited follow-through selling. For this Friday’s NFP report, economists are expecting pretty solid numbers, with non-farm employment expected to pick up by 176K, which would hopefully be enough to push down the jobless rate from 5.0% to 4.9%. Moreover, average hourly earnings are expected to increase by 0.3%, which is a faster rate of increase compared to the previous month’s 0.2% increase. 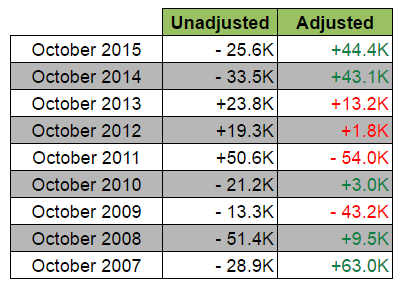 Looking at historical trends for non-farm employment, seasonal adjustments tend to depress the actual reading. And economists have had mixed success in forecasting the actual reading, overshooting on some, undershooting on others, but never quite hitting the mark, so keep an eye out for ISM’s PMI reports and the ADP report for additional clues. Anyhow, that’s all I’ve got for today. And as usual, just remember that better-than-expected readings tend to give the relevant currency a quick boost while a miss usually results in a quick selloff.